Leber hereditary optic neuropathy (LHON), or Leber optic atrophy, is an uncommon condition in which mitochondria in retinal nerve cells are mutated causing loss of central vision. It inherited and primarily affects young men aged 12 to 30. However, symptoms can happen at any age, to men or women. Every cell in our body contains chromosomes that carry inherited information in genes. Within each cell we have mitochondria that are the energy producers within each cell. These mitochondria also carry genes, and are inherited only from the mother. So when mitochondria are mutated, she will pass it on to all of her children, and her daughters will pass it on to all of their children. However, not all siblings develop the condition. Leber's generally develops in one eye, and then a few weeks or months later it develops in the other eye. The time when someone is losing their eyesight is often called the 'acute' period. After a few more weeks, the eyesight stops getting worse. Leber's can also develop more gradually over a period of years. The normal functioning optic nerve requires healthy functioning mitochondria. The optic disc (the point on the retina where the optic nerve enters) contains high concentrations of mitochondria, which suggests that the presence of properly functioning mitochondria is essential. Leber's involves damage to mitochondria in the ganglion cells, especially those cells that are part of the maculopapillary bundle, which comes from the macula. Mitochondria are found only in the part of the optic nerve that is not protected by the myelin sheath. Researchers suspect that oxidative stress and/or defective synthesis of ATP may be at the root of mitochondria damage. The enzyme, ATP synthase, creates energy storage molecules within the cell. Nerve cells have unique needs, and the fact that some parts of the nerve axons contain mitochondria while others do not, may be a key to understanding LHON. The body normally initiates cell death as part of its very specific evolution. The process of programmed cell death is known as apoptosis. Mitochondria play an important part in regulation of apoptosis. Researchers have found some clues as to the connection between LHON and apoptosis. 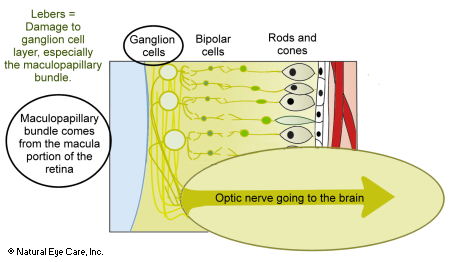 The optic nerve deteriorates, structurally and biochemically, in a manner consistent with apoptosis. Finally, mitochondrial apoptosis appears to take place in the presence of heightened levels of oxidative stress. It is thought that glutamate transport is impaired, contributing to oxidative stress, which in turn leads to retinal ganglion cell death. At first, one eye typically and suddenly loses central vision. Cloudiness and blurriness are experienced. About a month or two later, the other eye also becomes affected. There are many variations of the pattern. Although young men are most often affected, Leber’s may develop at any age in women or men. There may be some protective factor in women's X chromosomes, since women develop the condition more rarely. The female hormones, progesterone and estrogen, are currently suspected to play a role in protecting female carriers. Leber's is inherited through a gene which is only passed on through the egg cell from the mother, even though the mother may not experience any symptoms. Normal cells in our body contain 23 pairs of chromosomes; each cell contains 46. Each chromosome contains hundreds of thousands of genes, which are short segments of DNA that carry the genetic blueprint of our bodies. Each cell also contains mitochondria, which are the energy producers of the body, and without them, we could not survive. These mitochondria also carry genes, but only from the mother. If a mother carries a mutated mitochondria gene, which is linked to LHON, that mutation is passed to all of her children. The vast majority of LHON cases are associated with one of three primary mitochondrial DNA mutations; these are MT-ND4/G11778A, MT-ND1/G3460A4, and MT-ND6/T14484C. The most common is the G11778A mutation. This gene accounts for approximately 50–70% of all LHON cases. There are some twenty different genes currently known to take part in the development of LHON. Three particular mutations account for 85–90% of all cases of LHON. Other drugs causing stress, including drugs treating cancer, viruses, AIDS, malaria, heart arrhythmia, high blood pressure, and epilepsy. Cyanogens are chemical compounds that are found in some plant foods, such as peas, beans, and other legumes, almonds and other nuts, and apricots. They serve as a chemical defense against pest and competitive herbivores such as insects. The chemical is usually concentrated in the seeds, kernels, or wilted leaves of the plant, but it is also easily overcome by careful pre-ingestion food processing, such as soaking, sprouting, fermenting, cooking, pulverizing, and drying, or some combination thereof. Cigarette smoke also contains quantities of these substances. Fumes from paints, varnishes, hair dyes, and especially fat-soluble chemicals (liquids and vapors) that have benzene rings in their chemical structure, such as toluene. Stress-related chemicals that are naturally produced and released by the body, such as adrenaline, catecholamines, etc., as well as testosterone, and oxidizing chemicals. Free radicals. Oxidation creates free radicals in the body that have to be neutralized by antioxidants. Otherwise, the free radicals not neutralized damage healthy cells and ultimately contribute to, or cause, onset of disease that include chronic and degenerative illness such as cancer, autoimmune disorders, aging, cataracts, rheumatoid arthritis, cardiovascular and neurodegenerative diseases. Work on gene therapy presents some possibilities, otherwise, the condition is not known to be treatable conventionally. It may be that some factor in women's X chromosomes may be protective - since women get the condition more rarely. Clinical trials suggest that ibedenone may be shown to be moderately effective. There has been inconsistent anecdotal evidence for ubiquinone, a coenzyme Q10-like derivative that was shown to mildly alter progress of the disease, and in some cases, and for some mutations, cause spontaneous recovery. It is thought that inadequate amounts of CoQ10 reaching the mitochondria were the cause for early experimental treatment failures. Researchers report that LHON carriers are at risk for LHON, but might not develop the condition due to incomplete penetrance. This means that the mutation is "necessary but not sufficient" for LHON to develop. Therefore supporting mitochondrial integrity in LHON-impacted families with LHON carriers may be helpful in preventing onset. Copy number refers to the number of copies of a particular gene in a person's genotype. Efficient mitochondrial biogenesis, the ability of mitochondria to grow and divide, then, is a possible key to lowering the risk of developing Leber's. Therefore, we approach LHON from two sides. First, because copy number and mitochondrial mass are factors, we support neuronal health and mitochondria biogenesis. Second, we address environmental factors, such as smoking and excessive alcohol consumption, which may increase the risk of developing Leber's for people who carry the gene mutation. Living a healthy lifestyle, therefore, is highly recommended for those with Leber’s, or at risk for developing it. Free radical activity may also be a contributing factor. Eating a healthy diet, exercising regularly, and taking targeted antioxidants for eye health may slow down the progression of the disease and promote healthy vision. Our goal is to help people learn how to preserve healthy vision and introduce natural ways to boost circulation and energy production in the eyes. This supports nourishment of the optic nerve and related mitochondria and other parts of the eye, through the targeted delivery of antioxidants and other nutrients. Nutritional support for the optic nerve is important. Nutrients like carnosine, taurine, D-ribose, astaxanthin, glutathione, omega-3 fatty acids, B and C vitamins and other nutrients and minerals may be helpful as well as microcurrent stimulation. Due to the possible contributing factor of toxins, it is especially recommended that patients with Leber's avoid smoking tobacco and drinking alcohol and avoid other potential toxins. Klopstock, T., Yu-Wai-Man, P., Dimitriadis, K, Rouleau, J, Heck S, Bailie M, et al. 2011. A randomized placebo-controlled trial of idebenone in Leber's hereditary optic neuropathy. Brain. Tsao K, Aitken PA, Johns DR. 1999. Smoking as an aetiological factor in a pedigree with Leber's hereditary optic neuropathy, Br J Ophthalmol. May 83:577-581. Hipkiss, A.R. (2007). Could carnosine or related structures suppress Alzheimer's disease? J Alzheimers Dis. May;11(2):229-40. Brown, B.E., Kim, C.H., Torpy, F.R., Bursill, C.A., McRobb, L.S., et al. (2014). Supplementation with carnosine decreases plasma triglycerides and modulates atherosclerotic plaque composition in diabetic apo E(-/-) mice. Atherosclerosis, Feb;232(2):403-9. Reddy, V.P., Garrett, M.R., Perry, G., Smith, M.A. (2005). Carnosine: a versatile antioxidant and antiglycating agent. Sci Aging Knowledge Environ, May 4;2005(18):pe12. Cheng, J., Wang, F., Yu, D.F., Wu, P.F., Chen, J.G. (2011). The cytotoxic mechanism of malondialdehyde and protective effect of carnosine via protein cross-linking/mitochondrial dysfunction/reactive oxygen species/MAPK pathway in neurons. Eur J Pharmacol, Jan 10;650(1):184-94. Froger, N., Cadetti, L., Lorach, H., et al. (2002). Taurine provides neuroprotection against retinal ganglion cell degeneration. PLoS One, 7(10):e42017. Xu, S., He, M., Zhong, M., Li, L., Lu, Y., Zhang, Y., et al. (2015). The neuroprotective effects of taurine against nickel by reducing oxidative stress and maintaining mitochondrial function in cortical neurons. A Neurosci Lett, Mar 17;590:52-7. Lombardini, J.B. (1991). Taurine: retinal function. Brain Res Brain Res Rev, May-Aug;16(2):151-69. Ripps, H., Shen, W. (2012). Review: Taurine: A "very essential" amino acid. Mol Vis, 18: 2673–2686. Hansen, S.H., Birkedal, H., Wibrand, F., Grunnet, N. (2015). Taurine and regulation of mitochondrial metabolism. Adv Exp Med Biol. ;803:397-405. Heller-Stilb, B., van Roeyen, C., Rascher, K., Hartwig, H.G., Huth, A., et al. (2002). Disruption of the taurine transporter gene (taut) leads to retinal degeneration in mice. Faseb J, Feb; 16(2):231-3. Mahoney, D.E., Hiebert, J.B., Thimmesch, A., Pierce, J.T., Vacek, J.L., et al. (2018). Understanding D-Ribose and Mitochondrial Function. Adv Biosci Clin Med, 6(1):1-5. Mari, M., Morales, A., Colell, A., Garcia-Ruiz, C., Fernandez-Checa, J.C. (2009). Mitochondrial glutathione, a key survival antioxidant. Antioxid Redox Signal, Nov;11(11):2685-700.